By Aoife Mulford | November 16, 2010. Gladiator, the 2000 movie epic, totalled £ 29,731,955.04 in the UK box offices, overtaking Mission Impossible Two and the thought provoking What Women Want. 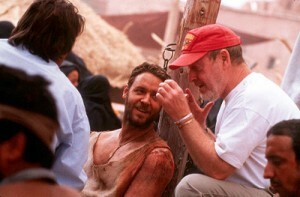 Gladiator catapulted Russell Crowe to worldwide stardom. Crowe, an Australian born actor, was previously known for his role in L.A Confidential, but it was Gladiator which made him a star. Crowe picked up the Academy Award for Best Actor as a result of his convincing performance as Maximus, a downtrodden, reckless former general, hell bent on avenging his family. The film, which is set in 180 AD Ancient Rome, tells the story of one man’s struggle against all odds to seek revenge from Julius Caesar. The first ten minutes outline Maximus’s background; how he was a beloved and admired general to both his men and his ruler, Caesar. The Emperor decides to crown Maximus the new Caesar, removing any chances his son, Commodus, had at the coveted position. Commudus does not take the decision lightly, so much so that he finds a way to remove Maximus as a threat to his crown, by murdering his family and shackling Maximus as a common slave. The special effects and the acting are what make this movie bearable. If you are a fan of fighting, humans fighting humans, humans fighting animals and thousands of people cheering, then this is your kind of movie. I enjoyed the setting of the movie, the Colloseum looked spectacular due to some very clever effects, and the costumes and music made it what it is- a major motion picture. All in all, I would recommend it. Be ready for a few gruesome scenes, but generally, it has it all- a good looking leading man, heartbreak, one man’s triumph against all odds, and a villain, who everyone loves to hate.